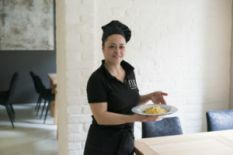 The location and cozy vibe of Bernardazzi restaurant in Odesa simply call for a glass of wine to travel to Italy without leaving the seat. The restaurant’s sommelier Aleksey Dmitriev surprises the guests with this exact purpose. 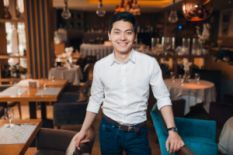 More than 15 years of experience in restaurant business, constant personal and professional development make Aleksey just the right make to ask about wine. We talked red, white and discovered the secrets of picking the right bottle for the night. How did you choose this career? Is it true that being a sommelier is a lifestyle? I began my way in the restaurant business as an assistant waiter in 2002. I've passed all stages of development and now am the managing partner and the main sommelier of one of the best restaurants in Odessa. Bernardazzi has already received all the possible awards in Ukraine and is the only restaurant in Eastern Europe, which has received 2 glasses Best of Award of Excellence from the American magazine Wine Spectator for seven years in a row. I began studying as a sommelier in 2004 and to this day I don't stop learning. It really is a lifestyle: enchanting, vibrant, sophisticated, fragrant and delicious. What do you like most about everyday work? Tasting of various products, wines. Not many people know but sommelier should be well-versed in everything from water to coffee. I also like visiting the wineries (I've already been in more than 15 countries), communicating with wine producers and communicating with guests in the restaurant. It all inspires and keeps you up on your toes because service job is very difficult both physically and psychologically. Is it possible to violate the "canons" of wine matching such as red wine is served with meat and white is served with fish? Or is it better to stick to the classic choice? We always violate it and we do not believe in these "canons". For us, a wine list of 1,200 items is an incredible palette that helps us surprise guests. We adore experimenting and adding sparkling wine, rosè and trending "orange" wines in the game. Tell us about the latest interesting wine discovery that you can buy in Ukraine. Wine discoveries are my passion. I always want to find something unusual and tasty for a decent price. I admit, recently I've had a fresh look at the white variety of Albariño from Spain. It is very relevant nowadays - refreshing, mineral, with subtleties of marzipan and green apricot. What tips will help non-specialists while picking good wine? Listen to your inner voice: what do you want today? Read up at least a bit about the main 8 sorts of grapes. White - Sauvignon Blanc, Chardonnay, Riesling, Gewürztraminer. Reds - Cabernet Sauvignon, Merlot, Pinot Noir, Sire. They all differ in the level of acidity, sugar, astringency, the presence of fruits, berries and floral aromas. Give the experts of a restaurant or wine boutique the opportunity to surprise you but give a clear request from your side. We all know what we want to choose from a menu, be it salmon, turkey or a large steak. Just like that, the wine may be light, fruit, aged in oak or very musky (tannin) with a long berry finish. Do not be afraid to experiment. Develop your palette! Photo source: Bernardazzi restaurant Facebook page. All images belong to their rightful authors.